I’ve covered this topic a little bit here and there with other posts, but I thought that it is such a common theme that it deserves it’s own title. Whiplash is essentially just rapid acceleration and deceleration of your head and neck. This kind of motion can happen in sports, or in play but is most commonly associated with car accidents. Whiplash is named for the motion of a whip. When the base of a whip is moved properly it only has to move a very slight amount yet the tip of that whip can reach beyond the speed of sound producing the crack that you hear. 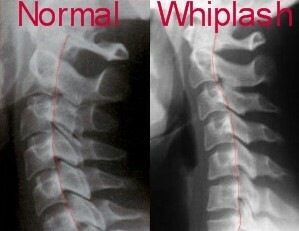 In whiplash accidents the spine acts as the whip and the head is the end of that whip. When the head moves in this uncontrolled manner, tendons muscles and ligaments (the soft tissues supporting the spine) are often injured as well as the joints themselves impacting one another. These injuries can cause unbalanced weaknesses and spasms. Though at first you may feel fine, over the next days and weeks these imbalances cause increasing strain on your neck, back and head. Symptoms can even develop weeks after the incident. These symptoms are usually headaches, and achy stiffness in your back, neck and or shoulders. However your doctor will want to rule out any serious neurological problems as well. With whiplash the pain is usually the reason that patients come in for care. The pain is usually only a small symptom compared to the whole. When you visit your chiropractor after a car accident you may have already been to the Emergency Room and had x-ray’s taken. Your chiropractor will likely want to see those films and may even take more of his own. You will be able to see on the X-ray films a straightening of the cervical spine. This is very predictable with these types of injuries. The joints have been moved out of place, and the muscle spasms will hold them there. When your spine is missing it’s normal curve it is unable to absorb shock in the way it was designed, and the reduced range of motion can become chronic. The sooner you begin treatment the better the outcome you are likely to have. For more on what to expect at a chiropractic visit in the case of whiplash click here. This entry was posted in Chiropractic in General and tagged Auto accident, car accident, Chiropractic, Chiropractor, whiplash on September 24, 2008 by cmnacnud.